Microsoft Edge, IE11, Firefox, Chrome (We recommend the most current versions). Windows 10, Windows 8.1, (Windows 7 is available using Chrome and Firefox browsers only). A broadband Internet connection (DSL/cable or higher) of 750 kbps or higher is needed for viewing NCHC.tv. If you have an Internet connection speed of 3.0 Mbps or higher and your computer meets the requirements below, you will be able to enjoy NCHC.tv at its highest video quality. CAN I WATCH NCHC.TV ON MY SMARTPHONE, OTT AND/OR TABLET DEVICES? YES! NCHC.tv uses adaptive html5 technology compatible with most mobile browsers, including iOS and Android operating systems. 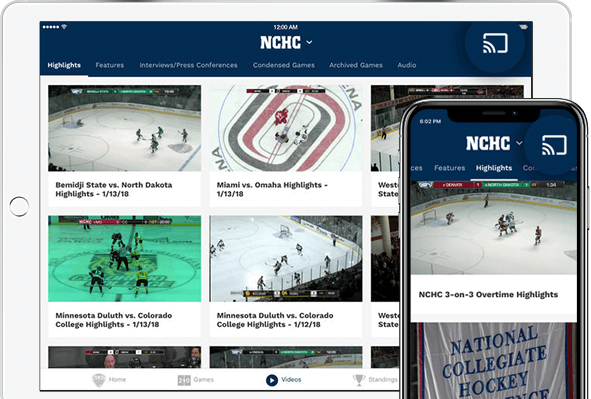 NCHC.tv apps are also available on iOS mobile and tablet devices, Android mobile and tablet devices, Roku TV, Apple TV, and Amazon Fire. How can I watch on my Apple TV? 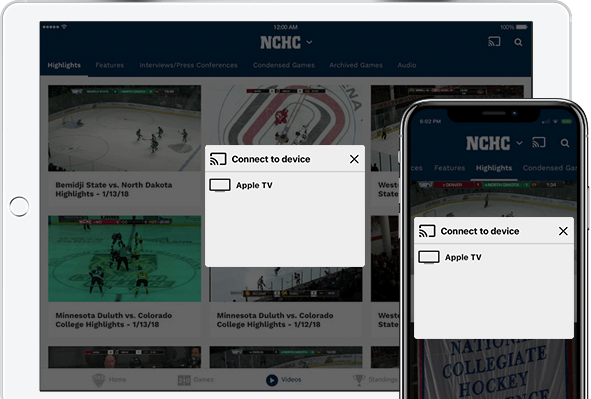 Users with the 4th generation Apple TV or later can download the NCHC.tv app from the App Store on their Apple TV device. Access to LIVE and premium content will require an NCHC.tv subscription from the desktop site, while on-demand video content will be available free of charge. The NCHC.tv app will not be available on the 2nd generation and 3rd generation Apple TV. Users with those devices can watch NCHC.tv content on their Apple TV devices using AirPlay via iPad, iPhone, iPod Touch or Mac (see below). iPhone 4 or later. iPhone 4s or later for AirPlay Mirroring. iPad, iPad mini. iPad 2 or later for AirPlay Mirroring. iPod touch (4th generation or later). iPod touch (5th generation or later) for AirPlay Mirroring. Connect your iOS device and your AirPlay device to the same Wi-Fi network. On your iOS device, swipe up from the bottom of your screen to open Control Center. Tap the name of the device you want to stream content to. You'll see (TV) or (speaker) next to each device, so you know what type of content you can stream. On iPad, you might need to scroll to see all of the available devices. When you choose an AirPlay device, audio or video from your iOS device will play on your AirPlay-enabled speakers or on the TV that's connected to your Apple TV. If you turn on Mirroring, you'll see your entire iOS screen on the TV that's connected to your Apple TV. Your TV will use the orientation and aspect ratio of your device. If you want the image from your device to fill your TV screen, you might need to to adjust your TV's aspect ratio or zoom settings. For more information on streaming content from your device to your TV visit Apple's site. How can I watch on my Roku or Amazon Fire TV? Go to the Roku Channel Store from a Roku device, or the Apps Category on Amazon Fire TV and download the NCHC.tv app. Access to LIVE and premium content will require an NCHC.tv subscription from the desktop site, while on-demand video content will be available free of charge. Plug in: Plug Chromecast into your TV, then connect the USB power cable to your Chromecast. Then either plug the other end of the USB power cable into an open USB port on your TV OR into the included power adapter which you will then plug into a power outlet. Note:Only use the provided AC adapter. Connect: Double check that the Chromecast and the mobile device, tablet, or laptop you are using to set up Chromecast with are both on the same Wi-Fi network. Set up Chromecast: Follow these simple Chromecast setup instructions or watch the video below to get your device cast ready. Watch: Cast videos, movies, TV shows, and more from your mobile device, tablet or laptop to your TV. HOW DO I SIGN UP FOR A PACKAGE TO WATCH LIVE AND ON-DEMAND GAMES? To sign up to any of the packages available, simply select one of the pricing boxes on the relevant pages or click on the 'Subscribe' button at the top right of any page. If you are already a registered user, simply click 'Sign In' at the top of the player or on any slide and enter your username and password. NCHC.tv accepts American Express, Discover, Visa and MasterCard credit card payments across the world. Please ensure that during the signup procedure you enter all the required details and remember your username and password (these will be emailed to you upon confirmation of payment). WHAT IS THE DIFFERENCE BETWEEN THE CONFERENCE PACKAGES AND THE INDIVIDUAL SCHOOL PACKAGES? Individual school packages provide live and on-demand content relevant to that school's teams, both home and away. The conference packages provide access to live and on-demand content available from all eight schools as well as all Quarterfinal NCHC Tournament games and the third-place game in the NCHC Frozen Faceoff. The conference package offers the best per-game value with an average per-game price well under $1.00. For your convenience, annual (season) and one-month subscriptions for the school and the conference-wide packages are set for auto renewal. Your subscription will auto renew one or 12 months from your date of purchase and will be charged to the card provided in your billing information. Those customers purchasing annual packages will also receive a reminder email prior to the auto renewal process taking place. To cancel your participation in the auto-renewal program, please contact customer support via one of the methods listed under "Contact Us" below. HOW DO I UPGRADE MY PACKAGE FROM A CONFERENCE TO A SCHOOL AND/OR A MONTHLY TO AN ANNUAL? WHY AM I ASKED FOR MY SCHOOL WHEN I SIGN UP? This feature helps us understand our audience better and provides an opportunity to see which fans of teams are using our new service. If you are not a student or alumnus/alumna of a particular school, please feel free to select the school with which you most closely identify to as a fan. WHAT LIVE EVENTS WILL BE FEATURED? NCHC.tv features, at a minimum, high-quality, multi-camera productions with live audio of hockey games originating from a NCHC member's venue (except games subject to blackout for selected television broadcasts). Over 140 live games will be available on NCHC.tv throughout the season, as well as all NCHC Tournament quarterfinal round games and the third-place game at the Frozen Faceoff. In addition, other live content from events such as NCHC Media Day, the NCHC Frozen Faceoff and the NCHC Awards Celebration may be available on the network if the event is streamed. WHAT DOES IT MEAN THAT A GAME IS "SUBJECT TO BLACKOUT RESTRICTIONS" DUE TO TELEVISION? The NCHC has national television agreements that restrict games shown live on their network to be streamed on NCHC.tv simultaneously. Other NCHC games televised nationally may also be subject to restrictions on NCHC.tv, depending on the network. If a game is blacked out due to television restrictions it will not be available on NCHC.tv. Check the box next to "Cache" and click on "Clear Now"
Please contact us with your request to unsubscribe at nchctv@neulion.com. ©2019 National Collegiate Hockey Conference. All Rights Reserved.